Commercial drivers plying Port Harcourt-Aba Expressway are counting their losses due to loss of business hours occasioned by traffic congestion caused by the closure of the Waterline/GRA junction of the road by the security agents that are stationed at the State Headquarters of the Independent National Electoral Commission (INEC), Port Harcourt. The Tide observed that the closure of the section of the road which started last Friday, still persists till date, causing heavy traffic congestion due to diversion from GRA junction to GRA Phase 2. Speaking to our correspondent, the Operation Manager of Sam Sam Jaja Transport Company, Mr. Pekins Jaja, lamented the closure of the section of the road by the security operatives, saying it has caused transporters loss of business hours due to traffic congestion. According to him, the number of trips made in a day had reduced beyond expectation since the closure was affected. 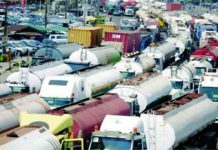 In his submission, an official of the National Union of Road Transport Workers, Ikenna Martins told The Tide that the presence of military tankers and security personnels in the state was scaring away many patriotic passengers who would have wished to travel but were scared by the present situation and as such causing loss of business to high way transporters. A passenger on board inter urban transport bus, Mrs Julie Kpobari, said that it was out of pressing need that she had, saying the current situation in Rivers State was frightening to travel.